NTT Facilities, Inc., a Japanese company providing solutions to energy industry businesses as well as telecom facilities, has installed "Solar UFO," a system that cleans water using photovoltaic electricity in the Koshigaya Lake Town district, Koshigaya, Saitama Prefecture, it was announced on April 19, 2012. The cleanup system is scheduled to be in operation from April 20, 2012 to March 31, 2013. This is part of NTT Facilities' eco-friendly and philanthropic activities. 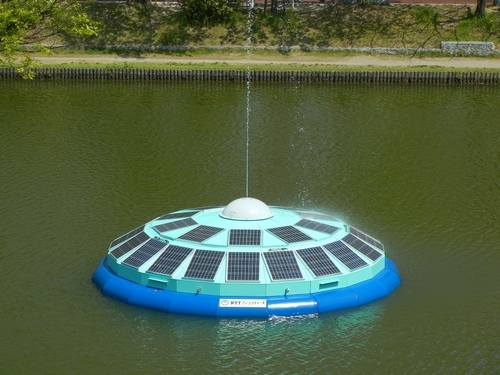 Solar UFO, floating on water, purifies the water using solar energy and does not emit any carbon dioxide. It has a floating disc-shaped body five meters in diameter, equipped with 1.3 kilowatt photovoltaic cells and also with filtering and aeration systems inside of the body. It can effectively manage the supply of photovoltaic power which varies with weather conditions and time of day, and by operating each system to be in the optimum condition it is expected to purify about 8,400 liters of water a day. The company has demonstrated the operation of Solar UFO since 2009, first in Osaka City and then in Fukuoka City, however, this is the first attempt in the east Japan. Koshigaya City has established its global warming action plan "Challenges by Eco-Town Koshigaya to Stop Global Warming," and has been implementing a variety of activities. The city expects the Solar UFO to be helpful in publicizing these activities. Meeting the Challenge of Stable Green Electricity Supply with Powdered Hydrogen Compound Fuel: Earth Project Co.